Affluent clients of financial planners can use their housing wealth a variety of ways to enhance retirement, including boosting sustainable portfolio withdrawals and delaying social security claiming. As strategic users affluent clients are quite different from many traditional users – often desperate homeowners who grabbed any remaining home equity after exhausting all their other resources. Focusing on affluent clients, this post summarizes key features of reverse mortgages and uses to increase retirement spending and reduce risks in retirement. A growing body of research on reverse mortgages in financial planning goes into depth on many of these topics. Reverse mortgages have evolved over the years, including significant improvements after 2008’s housing crisis, resulting in enhanced consumer protections, refined federal oversight, reduced costs, and better balance among the interests of clients, lenders and Federal Housing Administration’s insurance backing. The refined design is a Home Equity Conversion Mortgage (HECM). The Federal Housing Administration (FHA) administers it following rules laid down by the United States Department of Housing and Urban Development (HUD). The new view of a FHA HECM reverse mortgage for wealth management firms is that the “Highest and Best” use of HECM reverse mortgages is to improve a client’s retirement plan – not rescue it. It is a view I’ve come to share after diving into FHA HECMs and their applications. There are a variety of ways to use them strategically to good advantage, and hopefully very rarely as a client’s last resort. My perspective comes from working with wealth management clients going into retirement with investment portfolios in the $500,000 to $4,000,000 range. Many of these clients could benefit from FHA HECMs. Improving retirement plans: A client has a workable or nearly workable retirement plan, but desires an improvement. Increased retirement spending is an example of improved plan, as is planning to age in place at home. Increasing contingency: A client has a workable retirement plan but little contingency for the unexpected and undesirable: prolonged poor markets, health-related costs, or the need for home modifications or in-home assistance. Rescuing retirement income: A client’s retirement plan needs a rescue. Something they didn’t plan for happened – perhaps a spouse planned to work longer but couldn’t, or a spouse took a single life pension payout and now wishes they had elected 100% Joint and Survivor payout. Absolute last resort: Clients are in dire circumstances and have no other assets or income left. Or they can buy a new home using a HECM to pay for around half of up to a $625,500 home, or a smaller part of an even more expensive home. A line of credit is the most flexible way to access cash and takes advantage of a unique and powerful feature: the borrowing limit grows every month. The borrowing limit can’t be reduced or cancelled as long as the homeowner is in their home and meeting basic obligations of paying real estate tax, keeping homeowner’s insurance in force and doing basic maintenance. That’s different is several ways from a traditional Home Equity Line of Credit (HELOC). The graph shows a $300,000 home and the borrowing limit of a HECM Line of Credit over 30 years. The vertical bars show the home’s value growing at 3%. The loan’s compounding growth rate applies equally to the overall borrowing limit, the current amount borrowed, and the amount yet to be borrowed. The compounding rate resets set monthly. It is the sum of the current short-term interest rate (1-month LIBOR) and a fixed component of around 4%. Details on the compounding rate are at the end of this post. The compounding rate is shown in the graph at short-term interest rates of near zero, 2.5% and 5%, so the compounding rates shown are 4%, 6.5%, and 9%. The graph’s acceleration as the years go by is due to the compounding effect. The obvious result is more cash is available later – and in an amount that’s likely to grow substantially more than inflation. It may grow faster than most fixed income investments – especially those with guarantees like the FHA backing. Adding usefulness is tax treatment – any amount borrowed from the LOC is tax-free as it is loan proceeds. On a repayment an income tax deduction may be available. The tax treatment makes the LOC particularly useful for people in the 25% and higher state and Federal tax brackets. 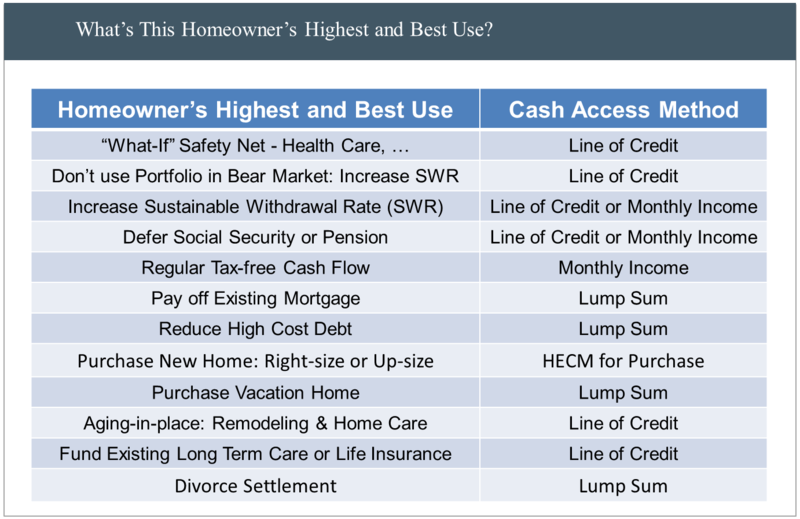 Other ways homeowners can access cash are by a lump sum distribution or monthly income. Monthly income is a payment guaranteed to last long as the owner occupies their home, or for a period the client chooses. At any time the homeowner can change the way they access cash. For example they could stop a planned monthly payment and get a lump sum. And they can combine access methods: a lump sum for immediate needs combined with a line of credit for later use. They can choose when, if at all, they pay down the loan balance before they leave the home. The loan becomes due when they leave their home. A HECM may be used to buy a new primary home. For a home valued up to $625,500, around half the purchase price can come from the HECM. (For a higher priced home, only $625,500 is considered for the HECM). The balance of the purchase price would come from other resources, including proceeds from selling a current home. Homeowners or their heirs have title to the home, not the lender. A HECM is a non-recourse loan. The homeowners or heirs can never owe more than the home is worth. When the homeowners leave the home, if the home’s value were less than the loan’s balance, FHA mortgage insurance steps in. That’s the purpose of the FHA mortgage insurance pool, paid for by a borrower’s upfront fee and part of the monthly charge to the outstanding loan balance. All owners must be at least 62 years of age. HECM applies to the primary home. A minimum of 50% equity is needed. The homeowner has three obligations: pay real estate tax, keep homeowner’s insurance in place, and do basic maintenance. No interest or principal payments are required, but may be made. The loan becomes due when the home is sold, the borrower changes residence, the last borrower dies or the last borrower is in a continuing care facility for 12 consecutive months with no prospect of returning home. How Do Reverse Mortgages and Portfolios Work Together to Increase Retirement Spending? The catalyst for attention to HECMs by the financial planning community was work by Salter, Pfeiffer and Evensky (2012, 2013) after the 2008 market downturn. They combined a HECM LOC with portfolio withdrawals in a strategy they call Standby Reverse Mortgages. In a severe market downturn, clients lived on a HECM LOC instead of withdrawing from their investment portfolio. After the market recovery repaid the HECM so it would be available if another severe downturn happened, or if the portfolio were exhausted. Client’s sustainable withdrawals improved dramatically. Using a HECM LOC as small as 8% of the portfolio ($40,000 LOC and $500,000 portfolio) noticeably increased spending. When the line of credit was larger compared to the portfolio ($200,000 LOC and $500,000 portfolio) sustainable spending increased over 200%! Sacks and Sacks (2012) and Wagner (2013) tested six other ways to augment portfolios with reverse mortgages, such as living on the reverse mortgage first until it ran out, using it last if the portfolio ran out, using it after weak portfolio gains, or doing fixed monthly payments throughout retirement. All ways they tested improved retirement spending. Two other teams (Sacks and Sacks, and Wagner) investigated many ways of augmenting portfolio withdrawals with reverse mortgage withdrawals. In every case the client’s sustainable spending levels increased substantially! Is available earlier instead of later in retirement. Ideally if used early, is repaid to grow for use later. For some clients an important consideration may be the impact on their total net worth and not just their spending levels. The traditional desperate user tapped their home equity as their only remaining asset, so naturally depleted their estate. Affluent clients may have the opposite result, depending on how they use their housing wealth. For example, Wagner’s results 15 years into the plan showed estate sizes (portfolio + housing wealth – loan balance) were often 10 to 30% higher depending on which of five reverse mortgage scenarios were used. Perhaps the rule of thumb is: when spending is pushed to the max, estate sizes suffer, but when housing wealth is used judiciously both sustainable spending and estate size can improve. What is A Client’s Highest and Best Use of a FHA HECM? As cash is flexible, HECMs can be used across a wide spectrum of client wealth and circumstances. Summaries of the research mentioned here and commentary from the financial planning literature is available in a separate post on this blog. This post highlights the general HECM program and its potential uses in financial planning. More complete descriptions with key details are available a variety of sources, including companies offering reverse mortgages, and the U.S. Department of Housing and Urban Development (HUD). A line of credit has a monthly compounding rate that equally applies to the overall line of credit (the borrowing limit), the current loan balance, and the untapped reserve. The monthly compounding rate is variable and has three parts: the variable amount is a current short-term interest rate (1-month LIBOR, now about 0.25%); the two fixed amounts are lender’s margin (generally 2.25% to 3.00%, set when the loan is taken out) and HUD’s Mortgage Insurance Premium (1.25%). As short-term interest rates increase the compounding rate increases. Three compounding rates from 4% to 9% are shown, roughly corresponding to 1-month LIBOR ranging from today’s near zero level to 5%. 5% is 1-month LIBOR’s long-term average before the 2008 FED action taking short-term interest rates to near zero to stimulate the economy. 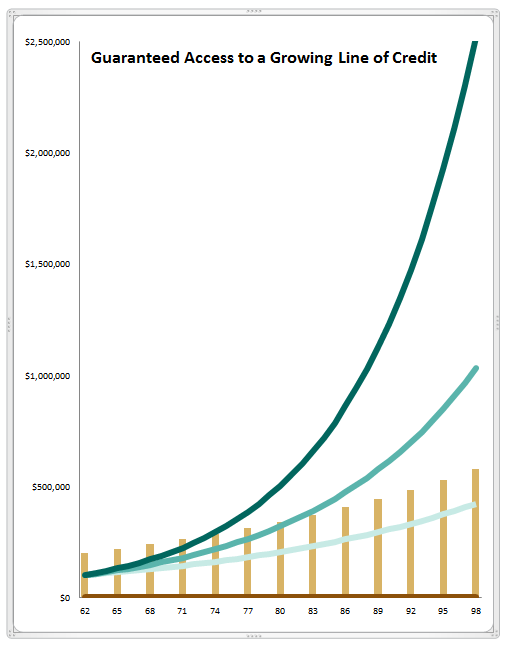 The line of credit in the graph is not tapped other than financing upfront costs. The vertical bars show the home’s value compounding annually at 3%. George: thanks for the comment! Turns out the vertical bars are home values growing at 3%. That was up in the text, but I’ll add to the assumptions. Robert Shiller at Yale knows as much about home price trends as anyone, and suggests inflation is the best estimate for home price growth, so that’s where the 3% comes from. That is different from RM illustrations – good to note. A useful tool would be a graph builder that allows different home value & PLF assumptions, age ranges, etc. hmmm. Wonderful discussion on the benefits of utilizing the reverse mortgage as a retirement planning tool. Of note is the excellent graph which displays the growth potential of the HECM Line of Credit. Thank you Tom for your extremely well presented information regarding the guaranteed access to growing line of credit that only a HECM can provide. Tom, you’ve done a great job with the blog. I’ve been enjoying reading through all these posts as I’m trying to gear up toward doing some research on this topic. Great to hear you’re thinking of research on reverse mortgages! The growing line of credit graph, especially the possibility of it exceeding the home’s value is eye-catching, and what triggered my interest in reverse mortgages as a retirement cashflow tool. Indeed, if someone had an untapped line of credit that exceeded the home’s value, they could withdraw that larger value. And after they leave the home they could in effect had the keys to the lender and not owe more – that’s the non-recourse property of the loans. The lender could sell the home, and would turn to the FHA mortgage insurance program for the difference. Likewise if they died, their heirs could do the same thing, or buy the home for 95% of the appraised value. The maximum LOC size will grow monthly and won’t ever go down. The LOC shares many properties with a fixed income part of an investment portfolio. The minimum growth rate will be over 3% and generally at least 4%. And if short-term interest rates spike up, the LOC growth rate spikes up. Some ways that homeowners whose retirements were (nearly) fully funded would use it is as a contingency fund that could be applied in a variety of ways – e.g. in times when their investment portfolio was down significantly (Salter and Evenksy’s Standby Reverse Mortgage research), or for unusual expenses, such as home modifications, down payment to a CCRC or other care facility, in home care, vacation trips, helping family – or anything else that cash could be used for! An incredible safety reserve! All in all, an intriguing resource. Seems almost too good to be true for someone with a sufficiently large retirement portfolio and a home with no mortgage. One could get a LOC and let it grow and draw upon it to make other prudent investments such as conservative dividend-paying stocks or rental apartment purchased at right price. One would be compounding home equity into an additional source of income. Nice. Enjoyed learning from you while at MetLife – A couple quick notes – In the industry, we refer to monthly payments instead of monthly income. The traditional view of income is different than advancing yourself funds from a loan. Also, the FHA limit went up in January to $636,150 vs $625,500. Thanks for the comments. Monthly income is not as descriptive as monthly payments, or cash draws, or… Some folks resonate to income while some jump on it as for them it properly implies that it may be confused with taxable income. This is a comment on the piece “Integrating Home Equity and Retirement Savings through the “Rule of 30”” . How do they propose to implement Strategy 1 (“If the performance was negative, the ensuing year’s income is withdrawn from the reverse mortgage credit line.”) if, as they assume, the portfolio assets are held in an IRA or 401k (“Retirement savings are assumed to be held in a diversified portfolio of securities—typically, but not necessarily, in a 401(k) account or a rollover IRA.”)? IRAs and 401k accounts are subject to RMDs, so you don’t have the option of not taking a withdrawal from them. You have to take a required minimum distribution, if over age 70.5 (or pay the tax penalty) but you don’t need to spend it. It can be invested in a taxable account. But the paper does not acknowledge that being forced to withdraw from IRA/401k accounts when the prior year’s performance was negative necessarily locks in the loss, whether you spend or reinvest the withdrawn money. It acts like withdrawing spending money from the reverse mortgage credit line is a way to avoid the loss. Don’t get me wrong, I think HECM credit lines are a great idea and we have one, but for those of us with most of our funds in IRAs our ability to use the credit line as the paper suggests is limited. If the withdrawn funds were invested in holdings with the same performance as those in the IRA, their investment performance (hopefully a recovery) would be the same. There may be some fractional difference due to any net differences in taxes on the transactions. The loss in the IRA is locked in, but not the net performance to the IRA owner who also has a taxable account. The tax costs are not trivial. They include taxes on the amount withdrawn, taxes on the additional amounts withdrawn to pay the taxes, and taxes on distributions from any withdrawn assets reinvested in taxable accounts. All of these costs are significant enough that the paper’s authors should not have ignored them and spoken as though the choice between withdrawals from IRAs and borrowings from the HECM line is frictionless.